A small town in the foothills of the Konkan stretch, Chiplun is a charming little site you should stop over at, before easing into the madness of Goa. The town is small, so you can see all the heritage sites, cover the food scene or just sit by the river. There’s Gowalkot fort, Sawatsada Waterfalls, Koyna Dam, Pandavaas Caves and Vashisti river to be seen in this beautiful town. 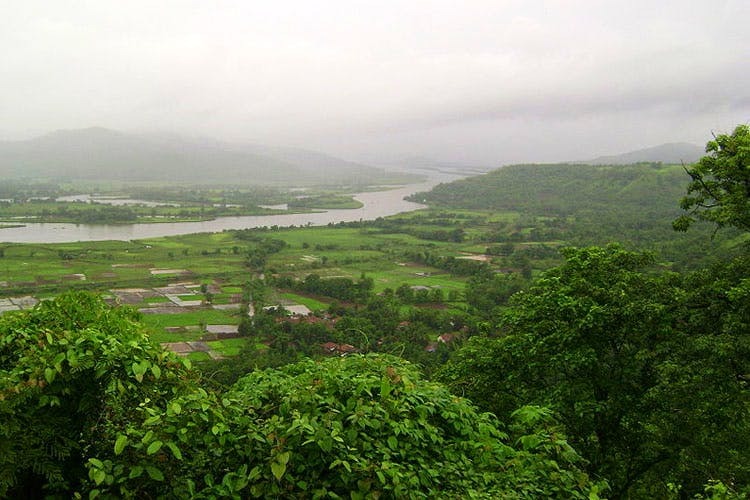 Located in Ratnagiri district, it is one of the major stops for buses while going to Goa. It’s about 250 kms from Mumbai and 300 kms from Goa. If you’re travelling to Goa by bus, it’ll be on the way, where the conductor will explicitly announce when it arrives. You can always ask him to tell you, when it does, in case the bus is not proactive. If you’re driving down, follow the directions here. There’s also numerous trains that go to Chiplun from Dadar, CST and Bandra. Check out the list of trains here. It’s a great place to cool off after the Goa trip or bracing yourself for it before. The sunset is unreal here, so it’s a great place to just take it easy on life. Snacks, toiletries and beach essentials.